Best Franchise Opportunities: Should My Franchise Be a Family Business? Should My Franchise Be a Family Business? For some people, it may seem like a no-brainer to include their loved ones in their ProSource® franchise. However, for others, this is a recipe for disaster. Many of our franchisees take advantage of this opportunity with their spouse, children, parents, or siblings and see great success. Others regret this choice. 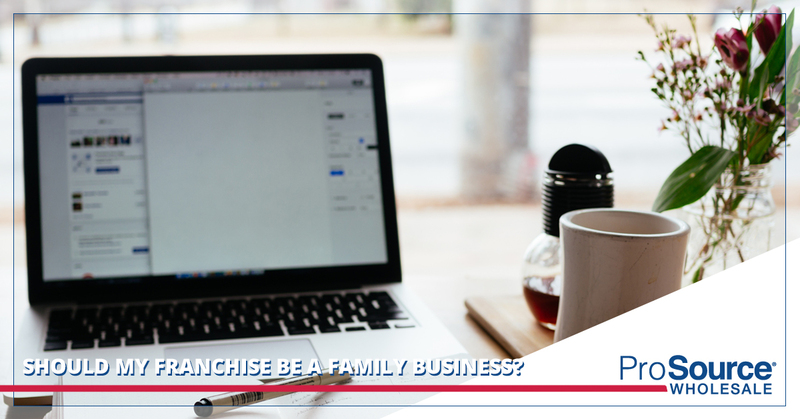 Whether or not you decide to make your franchise into a family business is a personal choice, and there are benefits and detriments to hiring your loved ones as your employees. Family businesses come with certain benefits, which we have outlined below. And vice versa. No one knows you like your family, and you know what to expect from them in return. You have spent years in their company, so you know their communication styles, how they interact with others, their strengths, and their weaknesses. While you may not have worked with them in a business capacity, you know their character, so it is far less likely for you to run into any surprises in terms of their personality and disposition. Business relationships are more empathetic. When it comes to a family business, you know your business partners have your back. They are people who genuinely care about you and the success of your business, so they are much more likely to be colleagues you can count on. Given how they feel about you, your business relationships are less likely to be obstructed by people working in their own best interest; they will empathize with you and put the business first. Your workplace will be more relaxed. Anyone who has made small talk with a coworker they have nothing in common with knows the challenge of building comfortable business relationships. When you’re a family business, you don’t have to worry about forcing a connection. You know these people well and can feel comfortable around them, lending itself to a more relaxed workplace. Family businesses are more marketable. Family businesses have market appeal. When your business is family-owned, it conveys a level of commitment, tradition, and hard work that consumers appreciate. Involving your family in your business is beneficial to your brand. You don’t have to worry about hiring. When you hire your family, you can skip much of the vetting process for employees, which can significantly delay how quickly you can start up your business. Don’t worry about interviews, background checks, and referrals; you know your family better than anyone, so these steps can be skipped. On the other hand, there are unique challenges to family businesses that may mean that this isn’t the best choice for your franchise. Professionalism may fall by the wayside. While it is important to be comfortable in your workplace, there is such a thing as being too comfortable at work. Family businesses sometimes struggle with professionalism, and depending on family dynamics, certain family members might slack, feeling no pressure to go above and beyond with their performance because their job feels secure. It can be hard for a business to succeed over the long-term when professionalism is undermined. Work conflicts can get personal. Conflict at the workplace is inevitable when everyone brings their different ideas to the table. With family businesses, these conflicts can quickly turn personal. For very contentious and persistent disagreements, this can create permanent rifts, particularly if they end up in court. A lack of new perspectives can stall a business. With a tight inner circle of family members, it can be difficult for outside perspectives to make an impression. If your family members are the key decision makers for the business, it can be difficult for the non-family members or other outsiders to express their opinions. A lack of fresh ideas can prevent your business from flourishing, particularly if you are favoring the perspective of your family members over that of your seasoned fellow franchise owners. Family businesses can develop unfair business practices. Family businesses often come with nepotism. This can create unfair business practices, such as promoting employees due to close ties rather than merit. They often come with succession plans that essentially hand off the business to the next family member in line rather than unrelated employees who excel at their work. This can sometimes lead to unqualified leaders, which translates into poor business performance. Leadership might struggle with tough conversations. If you have a family member who isn’t meeting expectations, it can be a much greater struggle to have those tough but necessary conversations. You may be more reluctant to tell a family member that they aren’t pulling their weight than you would be if they were an employee who isn’t related to you. Regardless of whether or not you choose to make your franchise a family business, we offer one of the best franchise opportunities out there. Our home improvement franchise offers a unique business model that is built on strong relationships. If you’re interested in this franchise opportunity, contact ProSource today to get started.